More than 70 people have been laid off following the collapse of South Lanarkshire-based rock music media firm Team Rock Ltd. Administrators were called in after the firm got into financial difficulties. A total of 27 staff in High Blantyre and 46 in London have been made redundant. A further seven staff - including four in High Blantyre - will be retained "in the short term" to assist the administrators. 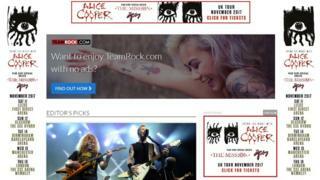 Team Rock ran a stable of rock music magazines as well as the website www.teamrock.com. Titles and brands include Classic Rock, Metal Hammer, Prog, the Golden Gods Awards and the Classic Rock Awards. The company, which has now ceased trading, generated annual turnover of more than £6m. Administrators at FRP Advisory are now seeking buyers for the business's magazine titles and other assets. Joint administrator Tom MacLennan said Team Rock had traded at a loss "for a significant period of time". He added: "The company explored every option to secure the long-term future of the business, however the constraints on the cash position of the business were such that administration was the only viable option. "The administration presents an excellent opportunity to acquire high profile rock music titles, products and brands that have a substantial global following. "The brands and assets could appeal to a music publishing business looking to expand its portfolio, or an entrepreneur that sees the potential for developing the brands." Team Rock, which was founded in 2012, bought the Classic Rock, Prog and Metal Hammer magazines from Future Publishing in 2013. According to the administrators, the company's website attracted more than three million hits per month. The company also owns an extensive archive of video, radio, images and magazines.